This would be the recipe to drive a person crazy with desire and craving for chocolate. The aroma gradually rises, floating through the air, alluring and distracting, making one think of the poor sailors who crashed into the rocks, insanely distracted by the singing of the beautiful, Die Lorelei. The baking takes place in a crock-pot after throwing a few ingredients together with a cake mix. 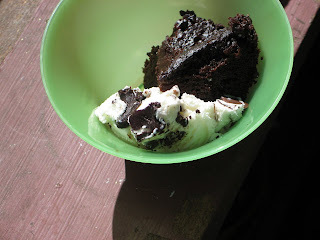 It is a country cousin to the popular molten "lava" cakes and is so delicious with a scoop of ice cream. Place the cake mix, pudding mix, sour cream, eggs, oil, and vanilla in a large mixing bowl. Add 1 cup water. Beat with an electric mixer on low speed until blended, 30 seconds. Stop and scrape down the sides of the bowl. Increase mixer speed to medium and beat about two minutes longer. Scrape down sides and fold in chocolate chips. We're making this tonight for Mike's birthday. In our new crock pot!